There is still more than a week to save on some collectable toys and characters from Marvel universe. LOL Surprise, Star Wars, Pac-Man retro arcade machine, Paw Patrol and many more toy brands and favorite characters of the best movies are featured in the first part of the Walmart Holiday toy sale ad. You can see the ad by one click on the image on right. Great ride-on toys are also available this week. 6V Paw Patrol fire truck ride-on will cost only $149! LOL Surprise bigger surprise, Sony PlayStation Classic are joys of the Christmas this year. The retro PlayStation is only $99 and available on Dec 3 - 15. Marvel ultimate protectors 8 pack contains heroes like Captain America, Iron Man, Black Panther, Hulk, Spider-Man. It's only at Walmart with $24.88 price on it. America's best toy shop offers much more than this. 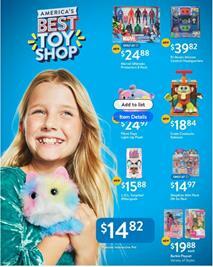 Visit the ad page for the details of all categories and each single item of the toy sale.